PlanToys Brings a Little Taste of Christmas Early! - Mamanista! Home > Learning > PlanToys Brings a Little Taste of Christmas Early! My boys got a little bit of an early Christmas present from one of our favorite toy brands, PlanToys! 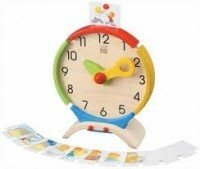 We received the Activity Clock and the Frog Life Puzzle which were both a hit! The Activity Clock was really an ideal toy for my oldest in kindergarten. He is learning his numbers, addition, subtraction and starting to learn to tell time. We use the clock after he finishes his homework and play lots of games. His time-telling skills have really improved. I also love when he makes up his own games and tries to time himself with the clock! So cute. My youngest loved the Frog Life Puzzle (or who he refers to as “Mr. Frog”). He’s at the age where he loves puzzles of any kind and this one is great because it helps us teach him early biology about the life cycle of a frog! He will put the pieces together the right way, dump them all out and put them together again over and over all the while talking to himself and making up his own little froggy story line.